The Hobbit and The Lord of the Rings are trilogies of epic proportions and there aren't many people out there who aren't familiar with them. I'm personally a huge fan and there have been times I've watched the entire Lord of the Rings trilogy back to back in just a day. 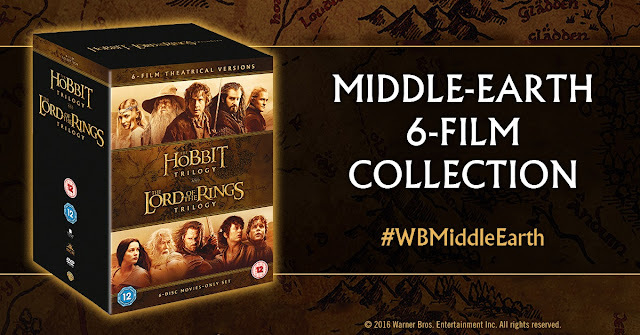 Warner Bros. Home Entertainment have just released the Middle Earth 6 film collection which is a 6 disc collectors edition box set available on both DVD and Blu Ray. I'm so excited about this because it enables us fans to relive the magic that is Middle-Earth and everything Tolkien. To mark the occasion I've put together a post about the most epic moments from the trilogies and if you read until the end of the post you will find the details on how to win your very box set too! 1. The Battle for Helms Deep. The first epic moment that I have to mention is the battle for Helms Deep. These action packed scenes have gone down in cinematic history and it's no surprise as to why. Our most beloved characters went head to head in battle with the Orcs and you don't know what is going to happen next. The scene's don't just make your heart race with excitement and anticipation but there are also moments between Legolas and Gimli which really make you laugh too. 2. When the Eagles come to the rescue. One of the most epic moments for me is when Gandalf and the Eagles are searching for Frodo and Sam at Mount Doom once the ring has been destroyed. Every time I watch those scenes I can't help but get goosebumps. Gandalf hadn't given up on the Hobbits the whole time and the moment he rescued them made me feel such relief. I also adore how the scene's were shot as they have such a peaceful and serene feeling to them. 3. When Frodo leaves middle earth. This is possibly one of the most bitter sweet moments in any film I've ever watched. If you haven't read the books and haven't seen the film before then Frodo's decision to leave will surprise you as you are under the impression it's just Bilbo, the Elves and Gandalf who are leaving for Valinor. It's so sad to see that Frodo can no longer lead a normal life in the Shire and seeing him say goodbye to Sam, Merry and Pippin is a real gut wrenching moment. Yet the smile he leaves us with at the end leaves you feeling happy for him too. Such a mix of emotion to end such an incredible trilogy. How would you like to win the Middle-Earth 6 Film Collection DVD collection?It's pretty straight forward to enter, simply look below and enter over on my twitter page! Good luck! What are your most epic moments within these two trilogies? Funny enough I was trying to find this on 123Movies last night. Without success. the battle of helms deep! I think the love story between Aragorn & Arwen is my favourite. Its just so beautiful!